I’ve got to be honest, when I first read what the cooking challenge was for this month, I was not excited. Fudge is not my thing at all! Editor’s note: I like fudge. Not only am I not a fan of the texture and flavor of fudge, but I have never ever attempted to make it before. I had never even watched my mom make her fudge before! I was dreading this challenge, and the thought of dropping out did cross my mind at least once. BUT…thank goodness Pinterest has popped up and caused such a craze, because it saved my life when I searched for Fudge! I ended up sharing this whole batch of fudge with my church last Sunday for our annual Thanksgiving Potluck, and the little bit that was left got eaten up at my husband’s bank. 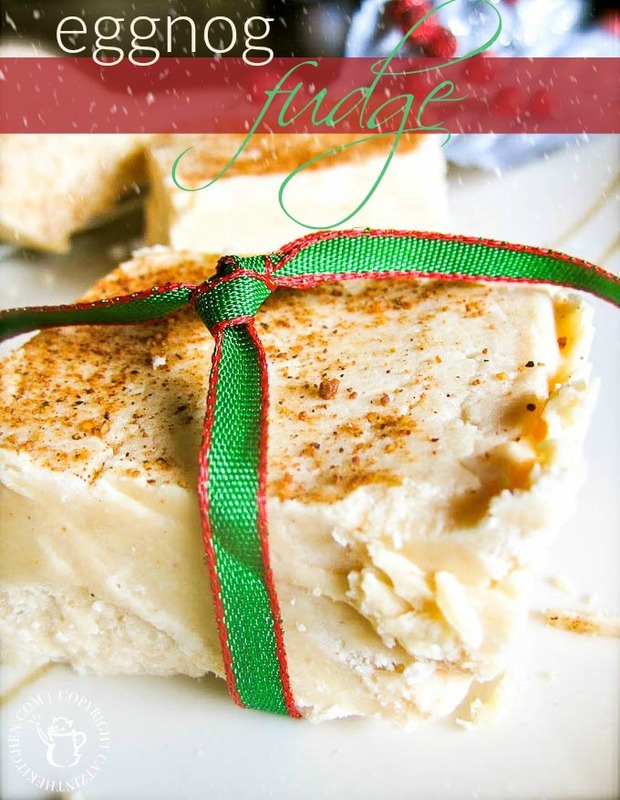 I received a ton of rave reviews on this fudge, which thrilled me to no end, because that meant I didn’t screw it up, lol! Line a 8 or 9-inch square pan with foil and let it hang over the sides. Butter the foil. In a heavy, 3-qt saucepan combine sugar, butter, and eggnog. Bring to a rolling boil, stirring constantly. Continue boiling 8-10 minutes over medium heat or until a candy thermemoter reaches 234 F, stirring constantly to prevent scorching. Remove from heat. Using a wooden spoon, work quickly to stir in chopped white chocolate and nutmeg until chocolate is melted and smooth. Stir in marshmallow creme and rum extract. Beat until well blended and then pour into prepared pan. Sprinkle with a little freshly ground nutmeg on top. Let stand at room temperature until cooled. Refrigerate if you'd like to speed up the process. When completely cool, cut into squares. Store in covered container. For me? Oh you shouldn't have.... how did you know that I love eggnog so much? Delish - love the ribbon touch! Looks so good! I love the cute little bow, makes such an adorable presentation! I'm also your newest follower. What a neat flavor for fudge. Glad you didn't drop out! This looks delicious! I made orange infused fudge and it's really good...it will make a fudge believer out of you :) Happy Holidays! I'm glad you decided to make this. It looks sooo good! I almost picked this one :) Looks delicious! Very cool recipe. I love your choice of blogs too. You have no idea how much I want a piece (or two) of this tasty looking fudge. I love eggnog! 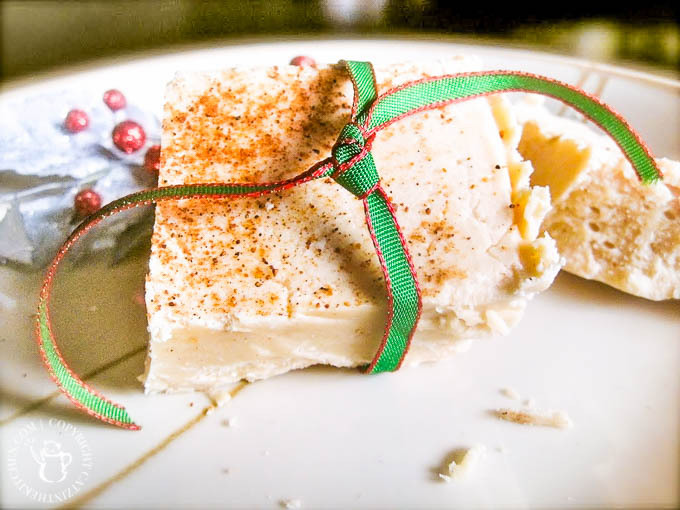 Eggnog and fudge together sound amazing! This fudge looks and sounds amazing. I would love it if you came to link to my holiday recipe swap blog hop. It is my first ever! Love these recipes. I found this post via pinterest and it looks amazing! Do you know if you could freeze this and approx how long it would keep? Just made this fudge, it is fantastic. will be an annual Christmas treat! I also found via Pinterest and can't wait to try! Made the fudge it was awesome, and everyone else thought so too.. Thanks for sharing!! This looks amazing! Does it need to be refrigerated? How long will it keep? Hi, Amy! It's been a few years since we blogged this recipe, but as we recall, it kept for about a week (I would recommend refrigerating). The original poster also mentioned that it freezes well, and keeps for several weeks that way. Enjoy!